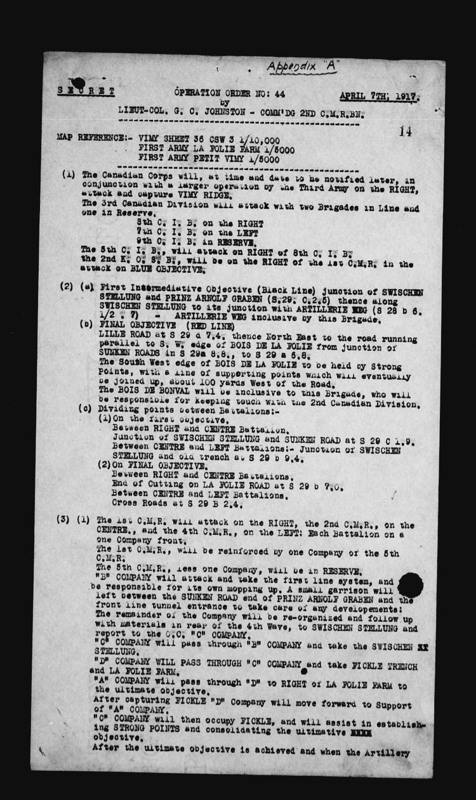 SECRET OPERATION ORDER NO: 44 APRIL 7TH, 1917. LIEUT-COL. G.C.JOHNSTON – COMM’DG 2ND C.M.R.BN. 1) The Canadian Corps will, at a time and date to be notified later, in conjunction with a larger operation by the Third Army on the RIGHT, attack and capture VIMY RIDGE. The 3rd Canadian Division will attack with two Brigades in Line and one in Reserve. The 5th C. I. B. will attack on RIGHT of 8th C. I. B.
the 2nd K. O. S. B., will be on the RIGHT of the 1st C.M.R. in the attack on BLUE OBJECTIVE. LILLE ROAD at S 29 d 7.4 thence North East to the road running parallel to S.W. edge of BOIS DE LA FOLIE from junction of SUNKEN ROADS in S 29a 8.8., to S 29 a 6.8. The South West edge of BOIS DE LA FOLIE to be held by Strong Points, with a line of supporting points which will eventually be joined up, about 100 yards West of the Road. The BOIS DE BONVAL will be inclusive to this Brigade, who will be responsible for keeping touch with the 2nd Canadian Division. (1) On the first objective. Between RIGHT and CENTRE Battalion. Junction of SWISCHEN STELLUNG and SUNKEN ROAD at S 29 C 1.9. Between CENTRE and LEFT Battalions:- Junction of SWISCHEN STELLUNG and old trench at S 29 b 9.4. Between RIGHT and CENTRE Battalions. End of Cutting on LA FOLIE ROAD at S 29 b 7.0. Between CENTRE and LEFT Battalions. Cross Roads at S 29 B 2.4. 3) (1) The 1st C.M.R. will attack on the RIGHT, the 2nd C.M.R., on the CENTRE., and the 4th C.M.R., on the LEFT: Each Battalion on a one Company front. The 1st C.M.R., will be reinforced by one Company of the 5th C.M.R. The 5th C.M.R., less one Company, will be in RESERVE. The remainder of the Company will be re-organized and follow up with materials in rear of the 4th Wave, to SWISCHEN STELLUNG and report to the O.C. “C” Company. “C” COMPANY will pass through “B” COMPANY and take the SWISCHEN STELLUNG. “D” COMPANY WILL PASS THROUGH “C” COMPANY and take FICKLE TRENCH and LA FOLIE FARM. “A” COMPANY will pass through “D” to RIGHT of LA FOLIE FARM to the ultimate objective. After capturing FICKLE “D” Company will move forward to Support of “A” COMPANY. “C” COMPANY will then occupy FICKLE, and will assist in establishing STRONG POINTS and consolidating the ultimative objective. After the ultimate objective is achieved and when the Artillery barrage permits, the O.C. “A” Company will push forward strong patrols towards PETIT VIMY, with the object of discovering strength of enemy: these patrols will, as much as possible, be covered by a machine gun barrage. (4) At ZERO and 30 seconds, two WOMBATS, one on LEFT and one on RIGHT of CHASSERY will be blown, all ranks must be informed as to this. (5) Two Vickers Guns will move forward in rear of “C” Company to SWISCHEN: from there, as soon as the situation permits, they will move forward to Support Line in rear of LA FOLIE ROAD. Battalion Colt Guns will be sent forward as soon as possible to ultimate objective, and will come under orders of O.C. Ultimate objective. (6) Two Stokes Guns will move forward in rear of “C” COMPANY. One Platoon of “A” COMPANY will carry STOKES SHELLS for the Guns as far as SWISCHEN, the platoon will then refrom and rejoin its company as it passes through. (7) Artillery programme will be issued separately. “A” COMPNY at S 29 B 6.3. to hold one platoon. “A” and “D” COMPANIES support line from S 29 B 1.8. to 2.2 (100 yards behind LA FOLIE ROAD) to hold three platoons and four Machine Guns. FICKLE TRENCH will be immediately consolidated as a Reserve Trench, with SWISCHEN to be used for thinning out. (9) “C” COMPANY will send four guides (in couples) back from SWISCHEN to report at Headquarters 4th C.M.R., in GOODMAN TUNNELL, for purpose of guiding carrying parties forward. “D” COMPANY will send four guides (in couples) back to Company H.Qrs in SWISCHEN for purpose of guiding carrying parties forward. Carrying parties referred to in this paragraph, will be from 5th C.M.R. (10) After the final objective has been taken, the following advanced H.Qrs, and Report Centres will be established. Brigade in PRINZ ARNOLF GRABEN at S 29 C.1.6. RIGHT BATTALION SPANDAUER HAUS at S 29 C.2.7. CENTRE BATTALION in SWISCHEN STELLUNG S 29 l 0.5. LEFT BATTALION in FLAPPER TRENCH at S 28 b 1.4. (11) YZ Night.The Battalion will assemble in the jumping off trenches as allotted to Companies and Details in preliminary instructions. GOODMAN TUNNEL will only be used for IN traffic, except for Runners. If ZERO HOUR is within one hour of Dawn, the Company will enter at BAY STREET at 3.30 A.M., and will clear the tunnel by 4.30 A.M. If ZERO HOUR is more than one hour after Dawn, the Company will commence moving in at 4.30 A.M., and remain in TUNNEL from VERT HALO to 100 yards West of BAY STREET. At ZERO minus two hours the whole move forward. “D” COMPANY filing out into its trenches immediately the 4th C.M.R., are clear. (13) Battalion Reserve Dumps will be in dug-outs in Front Line at S 28 C.3.2. and S28 C 2.5. for ammunition and rations. In support line at S 28 C 1.2. for engineering material. (14) All ranks must be warned that they are to drink no water or captured drinks of any kind until labelled as “safe” by M.O. (15) Signalling arrangements issued separately to B.S.O. (16) R.A.P., will be at WHITE CITY CAVE. O.C. 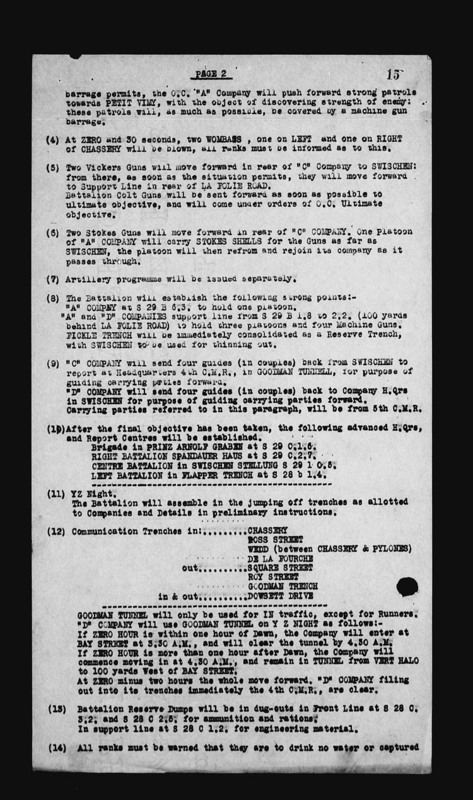 “B” COMPANY will detail an Officer to select a R.A.P., in the captured first line system and will send locations and guide to Battalion H.Q., when this is done. 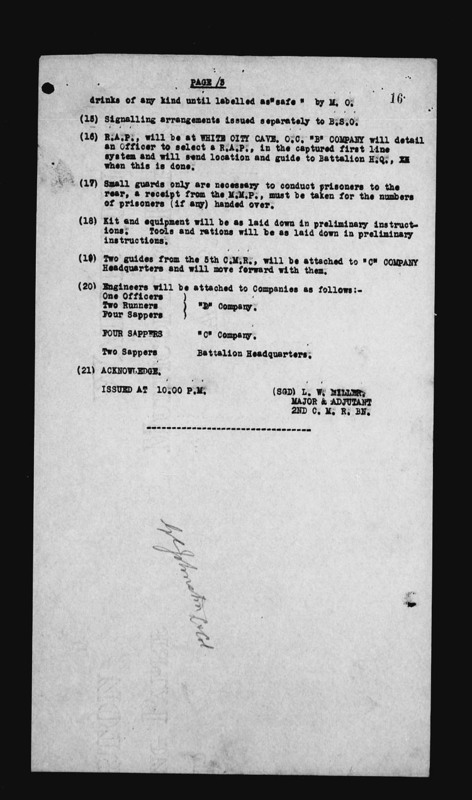 (17) Small guards only are necessary to conduct prisoners to the rear, a receipt from the M.M.P., must be taken for the numbers of prisoners (if any) handed over. (18) Kit and equipment will be as laid down in preliminary instructions. Tools and rations will be as laid down in preliminary instructions. (19) Two guides from the 5th C.M.R., will be attached to “C” COMPANY Headquarters and will move forward with them. Two Runners ) “D” Company.